Lucasfilm has sent a cease-and-desist letter to the makers of the Spyder III Pro Arctic laser, saying it looks a little too much like a lightsaber for its own good. Remeber the Spyder III Pro Arctic laser? It's a "Class 4" device, which according to Wiki means that it can "burn the skin" and cause "potentially devastating and permanent eye damage," not to mention setting stuff on fire. 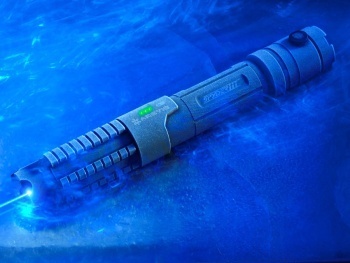 And in case that's not cool enough, Shanghai-based Wicked Lasers managed to turn this little baby up to 11 by making it look like a lightsaber. Wicked Lasers doesn't actually make any mention of lightsabers or Star Wars on its website, but nobody's fooled: Sites from Gizmodo to the Wall Street Journal (and, of course, The Escapist) made the obvious connection, as did Lucasfilm, which sent in an entire legion of its best lawyers to take care of business. "It has come to our attention that a company called Wicked Lasers is selling a highly dangerous product out of Hong Kong that is designed to look like a lightsaber from Star Wars," said Lucasfilm General Counsel David Anderman. "This product is not licensed or approved by Lucasfilm in any way. We have demanded that Wicked Lasers immediately cease and desist their infringing activities." "As Wicked Lasers itself admits, this product can cause serious injury to the user and other people," he added. "We strongly discourage consumers from purchasing it." I have no idea how the complaint would hold up in court but it seems to me that it'd be fairly easy to work around by adding a few fins or a pistol grip, or maybe building it into surplus DustBuster cases. It wouldn't be a lightsaber anymore, a definite downside, but a lawsuit avoided is a lawsuit won. I don't think playing up the danger angle is very smart, though; hearing words like "highly dangerous" and "cause serious injury" just makes me want one even more.